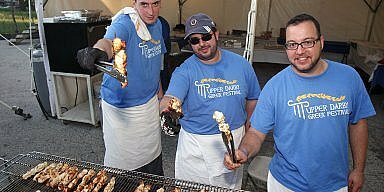 Upper Darby, PA – “Long Live the brotherhood between Armenians and Greeks,” said singer Kevork Artinian. Artinian was the featured singer with the Steve Vosbikian Ensemble that performed at the Pontian “Akritai” annual dance. The band was part of a special performance by Armenian musicians in honor of and in solidarity of the 100 year anniversary of the Pontian genocide by the Ottoman Empire (present-day Turkey). The Armenians and the Pontian Greeks share a bond since, in 1915, the Ottoman Empire first launched a genocide against the Armenians. 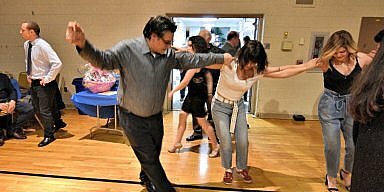 The Pontian “Akritai” society celebrated its 79th annual dance, which is held on the Saturday following Thanksgiving. The Steve Vosbikian Ensemble opened up the evening with a Greek song, “Misirlou,” that has transcended boundaries and time to become one of the most famous songs ever written. 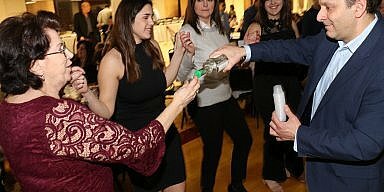 After their set, Effie Pavlidou Economou, president of the Pontian Akritai of Philadelphia and vice president, Stefanos Evangelopoulos welcomed the crowd. The Akritai dance troupe then performed a series of Pontian dances that was followed by an all-star cast of Pontian musicians from both the USA and Greece. The line up featured Alexis Parharidis and Giorgos Sofianidis straight from Greece, and from the USA, Christos Tiktakpanidis on the Lyra, Vasilis Tekeoglou on klarino, Ioannis Apazidis and Babis Almazidis playing daouli. Hundreds celebrated the annual event that draws huge crowds from as far away as Ohio and Connecticut but also drew attention to the genocide against both the Pontian Greeks and the Armenians, which the Turkish government has still not recognized.